The Pro 1000 is the new base model in ProForm's higher end line, with tons of great features like incline, large belt, strong motor and iFit coach training, all for only $999 when it's on sale. As such it is a great choice for those looking in this price range. You get a 6" backlit display with all of the relevant workout metrics such as calories, heart rate, speed, mileage and distance. The Pro 1000 easily folds up for storage and is well constructed. The ProForm Pro 1000 is a welcome addition to the series and has garnered a lot of attention and positive reviews. It is the new base model in the series, joining the 2000, 5000 and 9000, and offers a very nice array of features, especially for the price. You get a nice roomy, maintenance-free deck, 20" x 60", as well as up to 12% incline and space saving design that lets you fold up the treadmill quickly and easily for storage. The motor is strong and quiet and backed by a lifetime warranty. There are 22 built in workouts and heart rate monitoring via the hand grips. The best feature of the Pro 1000 is the new iFit Coach technology, which allows you to choose any location in the world via Google maps and the machine automatically adjusts to match the terrain's incline. Through iFit you also get additional trainer designed workouts, fitness programs, tracking and sharing and nutrition recommendations. It's a whole package and requires a small yearly membership fee. How does it compare to the other Pro Series models? It has a similar backlit display as the Pro 2000 treadmill, but that one has more workouts, wireless heart rate, wider belt, stronger motor, incline as well as decline and a better parts warranty. Moving up the lineup the Pro 5000 has a 7" Smart HD touch screen, and a few more workouts and stronger motor than the Pro 2000. The top of the line Pro 9000 gives you an even larger 10" Smart HD touch screen. All of the Pro models are packed with features and capabilities, and give you all you need to have an effective, enjoyable workout. 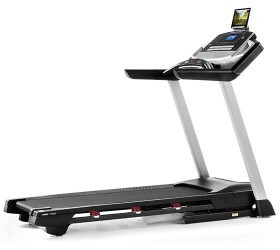 The ProForm Pro 1000 is a great choice at just under $1000, as it gives you incline, large deck, strong motor, iFit, music, cushioning and more. However, we would definitely look at the Pro 2000 as it offers so much more for only an additional $300. If a touch screen with internet appeals to you have a look at the upper tier models as well. Get the popular ProForm Pro 1000 on sale right now!